Hello, readers! With an added day this year, I’ve also included an added post! 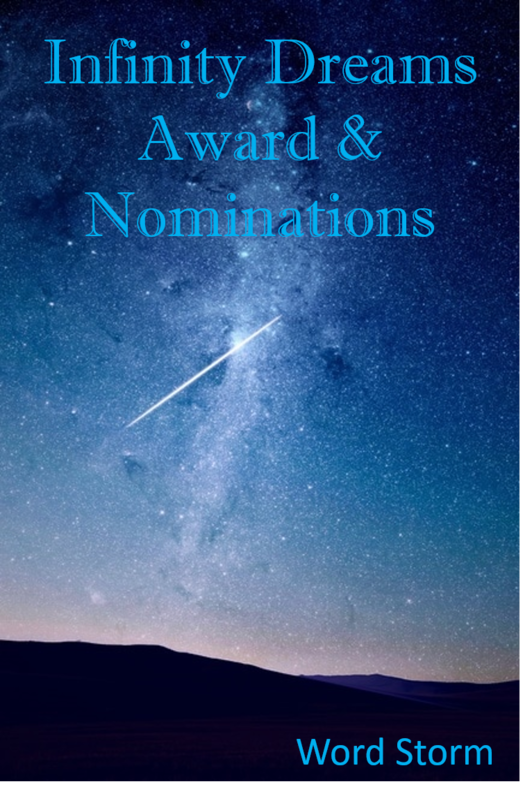 I was recently nominated for the Infinity Dreams Award, a blogger tag for writers so that readers can get to know them. Thanks again for the nomination by movie critic and blogger S. M. “Tea” Metzler (Tea with Tumnus). I can make no promises to keep this post short. 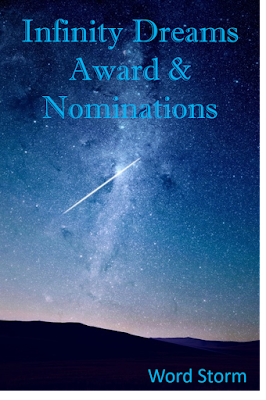 1) Thank and follow the blog that nominated you. Despite having nearly every clothing article imaginable in purple, I am not obsessed with the color. It’s one of those things where once somebody finds out you like something, that’s all they’ll give you. Yes, I like purple, but I also like a bit of variety, thank you very much. I have lived in three different countries excluding my home country: Germany, Italy, and England. No, I don’t have a favorite. I can speak survival German and Italian, meaning I can order food and ask for basic directions. My favorite type of chocolate changes from year to year. Right now it’s white chocolate. And if you don’t like chocolate, SO HELP ME… that’s fine. More for me. I have a scar on my right arm from running into a fence. I prefer pie to cake. 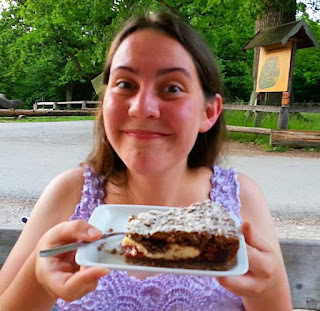 But I really like cheesecake and zupfkuchen, a Russian cheesecake with cherries, a chocolate crust, and sprinkled with powdered sugar. Yes, it is as heavenly as it sounds! Zupfkucken: a little piece of heaven. I have tried a variety of sports from ice skating to sailing to horseback riding to fencing. I’ve spent the longest time horseback riding (mostly Western, but I’ve done English), and I’m currently learning to fence using the foil (the bendy sword). I despise stereotypes and like thinking outside the box. I’ve never lived in the same house for longer than three years, and I can’t stand having my room with the same setup for longer than six months. I have a God-given tattoo (aka. a birthmark) in the shape of an angel on my right ankle. Although I don’t care for movies, I will randomly toss out movie quotes in most conversations. My immediate family members are obsessed with movies, so quotes are something I’ve picked up as a means of basic communication. 1) Your book has been published and you are asked for permission to make it into a feature film. You say yes. Which actor/actress would you pick for your main character? Tough question! I’m not very good at naming actors in general, so I’m not really sure. I’d prefer a talented, young actress who is generally unheard or just starting her career. I think big-name actors might have too many other characters associated with them. 2) Dream job? No matter how ambitious? Shieldmaiden of Rohan. I could live in Middle Earth, horseback ride with some of my favorite characters, and wield a sword. I see no downsides to this. Except perhaps orcs… and creepy men… and ring wraiths… On second thought, maybe there are some downsides. Realistically, I’d like to be an author who can afford to write full time and attend writer’s conferences on a yearly basis. 3) If you had a superpower what would it be? One of my favorite questions! I always have a hard time picking between two. 1) Chameleon powers: the ability to climb well, look in two different directions at once, and camouflage myself. 2) The power of suggestion: a telepathic ability to implant/suggest thoughts, such as the slamming of a door, a phone ringing, or a bug bite, etc. It may seem small, but there is so much I could do with it. 4) Who is your favorite character to write and why? It’s a tie between two characters. First, I enjoyed writing Thane, one of Lorne’s friends from Breaking a Thief. I like him because even despite his shortcomings and obvious blunders, he shows great courage when everybody expects it of him the least. Another character I’ve enjoy writing is a more recent one—Finley Craig, another supporting character in my latest project. Though he’s defiant and reckless, he knows how to see a job through to the end. 5) What kind of music do you enjoy listening to while writing? If it helps you write, how? Movie soundtracks. They help my mind get into a certain mood. For example, if I’m writing fantasy, I’ll usually listen to Thor or How to Train Your Dragon, but I listened to the Sherlock Holmes soundtracks while writing Breaking a Thief. Soundtracks help me to focus and encourage me to write faster when the tempo picks up. 6) Currently, your favorite book quote? 7) If you were allowed to meet just one fictional character, who would you pick? 8) How would you like your writing to impact your readers? I want to be able to move my readers. To make them laugh and cry. I want readers to be inspired and to be able to relate on a personal level with at least one character. Even if readers don’t remember my name or the plotline, I’d like something in the story to encourage them to reflect on life. Self-doubt and Fear. I can be my biggest critic and have a tendency to overthink everything. Many times I assume that I’m not good enough and won’t be able to achieve anything… despite how far I’ve already come. Both! I prefer strong teas that aren’t fruity, especially spiced chai, lemon ginger, and mint tea. As for coffee, I like it strong and black, but I also drink cappuccinos and espresso macchiato on a weekly basis. 11) If you could travel to just one destination in all of your favorite fandoms/books/movies, where would you go? Another difficult question. There are so many places I’d like to visit and things I’d want to do and see and people I’d want to talk to. But if I could pick only one, I’d probably visit the Silver Sea from The Voyage of the Dawn Treader. This particular book from The Chronicles has so many portions of sheer wonder. As the characters draw closer and closer to the end of the world, gradually being able to look straight at the sun as they live on light, I’m reminded of the parallels of being so close to heaven. Wouldn’t it be something to travel so close to Aslan’s country? If you could have lunch with any author living or dead, who would you want to meet? If you got stranded on a desert island and could have one book with you, what book would it be? What is one of your big goals for 2016? What’s one of your favorite character types? Why? Which time travel theory (alternate dimensions vs. fixed past vs. malleable past) do you prefer?